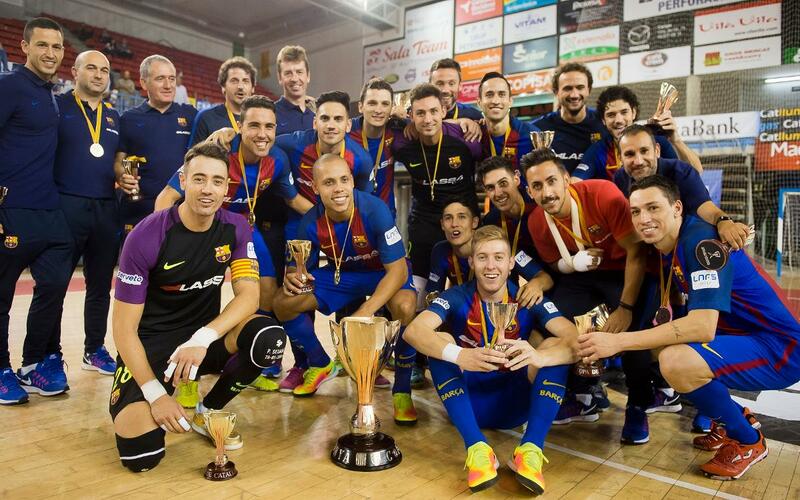 The Barça Lassa futsal team wins the Catalonian Cup again by beating Catgas Energia Santa Coloma 6-4. Barça imposed themselves on the game and dominated throughout taking a 6-1 lead before Santa Coloma got a few goals back in the final five minutes once the game was lost. This victory gives the blaugranes their eighth Catalonian Cup in total and their fourth in succession. The game was intense but cagey in the opening moments, with the defences on top and chances hard to come across. Roger Serrano broke the deadlock finishing from a rebound from Bateria's shot. The goal gave Barça confidence and they doubled their lead through an unfortunate own goal. However, Sergio González pulled one back before the break for Santa Coloma. With the game fairly well-balanced, Barça Lassa started the second half in a decisive mood. Goals from Serrano and Quintela gave Andreu Plaza's team a comfortable margin. As the match advanced Barça were increasingly in control and confirmed their victory with two goals in as many minutes from Ferrao and Aicardo. However, Santa Coloma's heads never dropped and they got their rewards with three goals that made the final score look closer than the game really was.